It’s a big moment after months of wearing braces to finally get a glimpse of your new smile. The crooked teeth and poor bite are gone — and in their place are beautiful, straight teeth! If you’re not careful, though, your new look might not last. That’s because the natural mechanism we used to straighten your teeth may try to return them to their previous poor positions. Contrary to what many people think, teeth aren’t rigidly set within the jaw bone. Instead, an elastic, fibrous tissue known as the periodontal ligament lies between the teeth and the bone and attaches to both with tiny fibers. Though quite secure, the attachment allows the teeth to move in very minute increments in response to growth or other changes in the mouth. 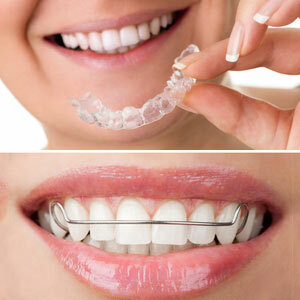 Orthodontic appliances like braces or clear aligners put pressure on the teeth in the direction we wish them to move. The bone dissolves on the side of the teeth where pressure is being applied or facing the direction of movement and then builds up on the other side where tension is occurring. The ligament, though, has a kind of “muscle memory” for the teeth’s original position. Unless it’s prevented, this “memory” will pull the teeth back to where they used to be. All the time and effort involved with wearing braces will be lost. That’s why it’s important for you to wear an appliance called a retainer after your braces have been removed. As the name implies, the appliance “retains” the teeth in their new position until it’s more permanently set. For most people, this means wearing it for twenty-four hours in the beginning, then later only a few hours a day or while you sleep. The majority of younger patients eventually won’t need to wear a retainer once bone and facial growth has solidified their teeth’s new position. Older adults, though, may need to wear one from now on. Even so, it’s a relatively slight inconvenience to protect that beautiful, hard-won smile. What Is Causing My Toothaches?